Stocks in London on Tuesday are seen pulling back slightly from Monday's strong start to the week, with third-quarter earnings from oil major BP due ahead of the open. UK Chancellor Philip Hammond on Monday pledged a GBP20.5 billion post-inflation increase for the National Health Service over the next five years as well as unveiling early increases in tax-free personal allowances. This budget being dependent on a Brexit deal is what prevented traders from getting too excited. We don't have any figures today from the UK on the economic calendar front. 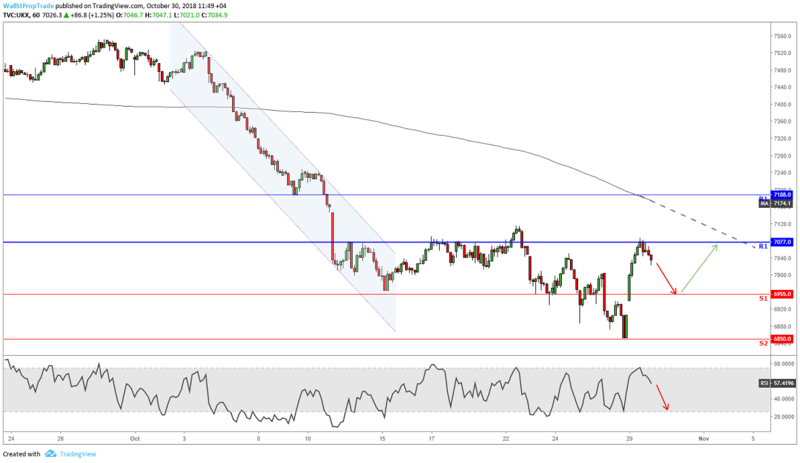 After the UK index fell to its lowest level since March 26th last week, the index is now in recovery mode bouncing back from the 6850 key technical support level and pushing through the first resistance level. However price is still below the 200-period MA and this is considered by many short-term traders as bearish. The index is overall assessed as technically neutral for the medium term. The RSI is mixed to bearish signaling downward momentum in the short term.